More than ever, incorporating environmental sustainability into products, processes and assets is a central business imperative, with significant opportunities to enhance profitability, decrease risk and win new business. In the next few years, sustainable design strategies and green building will become a standard expectation of the market, alongside traditional considerations like cost and durability. In anticipation of this market transformation, our mission at Autodesk is to make sustainability easy, insightful and cost-effective in our highest impact industries by delivering modelling, simulation, analysis and process management solutions to streamline and democratise the practice of sustainable design. 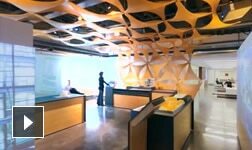 These solutions combine design and life-cycle management software workflows and consulting services delivered through Autodesk Consulting (US site). Sustainable design becomes a priority. Autodesk sustainability solutions for buildings are based on Building Information Modelling (US site) (BIM), an intelligent model-based process that provides insight for creating and managing projects faster, more economically and with less environmental impact. BIM allows architects, engineers, contractors, owners, property managers and assessors to optimise various sustainability parameters. These parameters can include design (site selection and orientation, electricity and fuel sources, construction equipment specifications and waste), operations and maintenance (energy use, natural ventilation, daylighting) and decommissioning or renovation, such as upgrades for energy efficiency. Autodesk sustainability solutions for infrastructure are also based on BIM. They help to provide the insight master planners, civil engineers, contractors and owners require to reduce transportation congestion; manage water treatment, distribution and flood control; simulate and analyse low-impact development stormwater strategies; incorporate triple bottom line analysis into early stage planning tools to help justify green infrastructure project costs; increase grid efficiency and renewable energy generation; and protect sensitive habitats and landscapes. Autodesk sustainability solutions for manufacturing are based upon Digital Prototyping (US site), simulation, lifecycle management and factory design platforms, so multi-disciplinary teams can explore, implement and communicate sustainable design decisions. This process helps product designers, engineers and manufacturers create, validate, optimise and communicate ideas from the conceptual design phase through to the manufacturing process, delivering innovative products to market faster.